The late Zbigniew Brzezinski, who died on May 26 near Washington, DC, was another of the Russia-hating Galicians who grew up in safe haven in Canada. Like Chrystia Freeland’s maternal grandfather, Michael Chomiak, though the late Chomiak may have murdered the late Brzezinski if he had managed to get his hands on him during World War II. Brzezinski, Chomiak, and Freeland blamed not Germany, but Russia, imperial and Soviet Russia, for taking away their Galician birthright; they spent lifetimes advocating war against the Russians in revenge. Chomiak also spent 1939 to 1945 on the German side, liquidating the Poles of Galicia, as well as the Jews and the Russians. Brzezinski was safe in Canada by then, where his father Tadeusz Brzezinski, a professional diplomat, was Poland’s consul-general to Montreal. He remained there, employed by the Polish government in exile, after Germany invaded Poland and set up a special administrative zone for Galicia, incorporating southeastern Poland and northwestern Ukraine; Lvov (Lwow, Lviv) where the Chomiak family was living; and the Tarnopol (Ternopil) district where Zbigniew Brzezinski claims his nobility had its origin. Brzezinski didn’t think much of Canada. From the age of 10 until he graduated from McGill University at the age of 22, he lived in Westmount, the upper-class district of Montreal, and at a summer dacha 80 kilometres north of the city. The Brzezinski family home at 60, Chemin St. Sulpice, Westmount (Montreal). He considered Montreal “provincial”. He also resented being blocked in his ambition for a career in the Canadian foreign ministry on account of his nationality. In his only reference to Canada in The Grand Chessboard, Brzezinski’s 1997 master plan for what he subtitled “American primacy and its geostrategic imperatives”, Brzezinski makes just one passing reference to his second homeland. 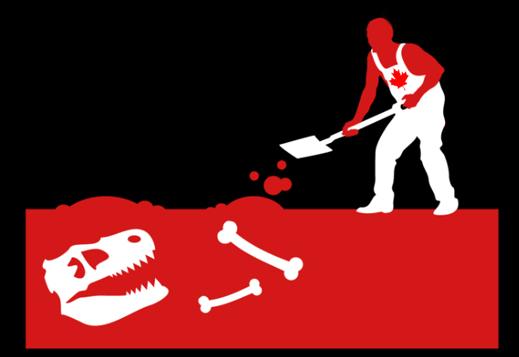 He calls Canada “a state that is respected for the constructive use of its wealth and power but one that is neither feared nor resented.” What Brzezinski meant was that if a country is neither feared nor resented, it has no power worth the term. Brzezinski wanted power and to be feared and resented himself. For that Canada was too small and insignificant to suit his ambitions and purposes. So was Galicia, and Poland too; although according to Radoslaw Sikorski, a Polish and British citizen, foreign minister of Poland, speaker of the Polish parliament, and Russia-hater, “during the decades when Poland was stuck against her will behind the Iron Curtain, he [Brzezinski] and the Polish pope were the two most important voices for a free Poland abroad.” Ousted from Polish government and politics, Sikorski is at the moment an employee of the Brzezinski Institute on Geostrategy at the Center for Strategic and International Studies (CSIS) in Washington. Brzezinski’s family name identifies its origin in Brzezany (Бережани), though Tadeusz was born in Zloczow (Zolochiv), Zbigniew in Warsaw. 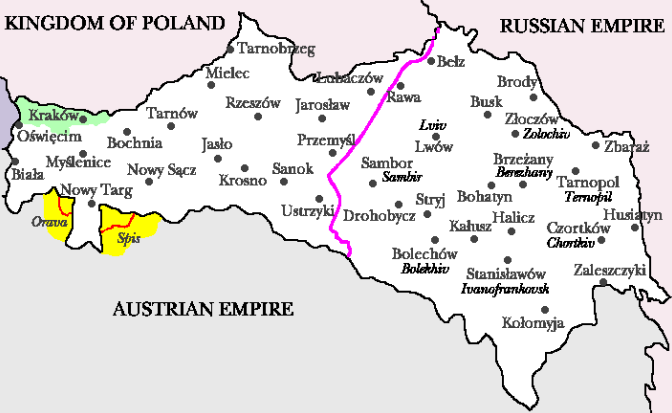 Brzezany is 90 kilometres southeast of Lviv in territory on the Russian empire side of the line dividing the older Polish empire. Zolochiv is equidistant from Lviv but due east, about 50 kilometres north of Brzezany. Brezinski allowed himself and his family to be reported as having aristocratic or noble origins. He didn’t elaborate. The archive of the szlachta, the Polish warlords whose armed gangs got them large estates and aristocratic status in the Kingdom of Poland from the 15th century, is bare of any reference to the Brzezinskis among the major aristos, or the even minor ones. By the standard of the princes of the house of Radziwiłł, and of Princess Radziwiłł, President John Kennedy’s sister-in-law Lee Bouvier, Brzezinski was a nobody. Brzezany (Berezany) on the map of Ukraine today; Zloczow, where Brzezinski’s father was born, is Zolochiv (Ukrainian: Золочів), is 60 kilometres to the north. During World War II Brzezany was occupied by the German Army, and administered by Galicians like Michael Chomiak; that’s Chrystia Freeland’s grandfather and proponent of the idea that Brzezany should be liberated, er liquidated of Poles, Jews, Russians, gypsies, communists. For that purpose the Germans set up the Bełżec death camp nearby, and later Majdanek. Lucky Brzezinski, who would have been rounded up and shipped to one or the other as a member of the Polish-speaking majority of Brzezany. But by then Brzezinski and his family were safe in Montreal. As the Chomiak (Freeland) family fled to Bavaria with the German forces, and then signed up with US intelligence agencies running sabotage and propaganda operations in Soviet Ukraine, Tadeusz Brzezinski remained a Polish state employee until 1945. He then joined the Quebec culture ministry to manage French-speaking centres around the province. While the Lviv University graduate Chomiak spent the rest of his life mobilizing Ukrainian-Canadians from a home in Alberta (he died in 1984), the Lviv University graduate Tadeusz Brzezinski was doing something similar from Montreal at the Polish Canadian Congress, then the World Polish Congress. He died in 1990. 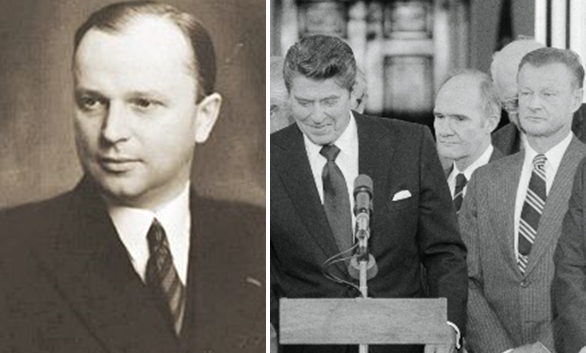 Left: Tadeusz Brzezinski. Right: Zbigniew Brzezinski, with President Ronald Reagan in 1981. Brzezinski claims (posthumously) that Reagan asked him to continue as his National Security Advisor, after President Jimmy Carter was replaced at the start of that year; Brzezinski claims he turned Reagan down. Left: Michael Chomiak with German military administrators in Cracow, 1943. Right: Chrystia Freeland behind Prime Minister Justin Trudeau at Auschwitz in 2016. Michael Chomiak and Tadeusz Brzezinski may have bumped, non-violently, into each other without recording the event for Canadian, Polish or Ukrainian posterity. Chrystia Freeland hasn’t said she was acquainted with Zbigniew Brzezinski, or inspired by his “voice for free Poland”; that’s to say, Galicia is Poland, not Galicia is Ukraine, the Chomiak-Freeland idea. Freeland was once a junior afternoon panellist at a CSIS global security talkshow in April 2012, when Brzezinski was a senior panellist in the prime morning spot. In July 2014 they appeared together on a CNN talkshow to blame President Vladimir Putin for the destruction of Malaysia Airlines flight MH17, which had been shot out of the air over eastern Ukraine three days earlier. According to Brzezinski, “this is truly a historically defining moment… We are, in fact, facing the first use of force over territorial issues in Europe since the outbreak of World War II. Putin is doing it.” Brzezinski recommended setting up a war crimes tribunal to indict and punish those responsible for the killing of all on board MH17. Brzezinski’s idea was that either Putin should put on trial those of his underlings whom Brzezinski already believed were guilty; or if Putin refused, that would prove to Brzezinski’s satisfaction that Putin was guilty of the crime himself. McGill University hasn’t mentioned Brzezinski since 2001 when he was identified as a past Polish visitor of note (not a graduate), trailing Pope John Paul II (then Cardinal Karol Wojtyla) and the poet Czeslaw Milosz. Freeland’s tweet file is voluminous, but the only death she mentioned on May 26 was a terrorist attack in Egypt. Freeland hasn’t mentioned Brzezinski before, or since. The Canadian media have stuck to US press reports for Brzezinski, except for the Global Radio News Hour, produced and presented from Manitoba by Michael Welch. Listen to the full hour on Brzezinski’s record with Jay Dyer, Andrew Korybko, John Helmer (min. 36.30-43.40), and Filip Kovacevic. Click to listen. In Canada, the Global Radio News Hour is broadcast by nine radio stations in British Columbia, Manitoba, Ontario and New Brunswick, including Simon Fraser University, University of Victoria, University of Winnipeg, campus and community radio stations in Ontario, and the University of New Brunswick St Johns. In the US, the Global Radio News Hour airs from Boston College, Massachusetts, and the Progressive Radio Network. For more details, call-signs and listening times, click.